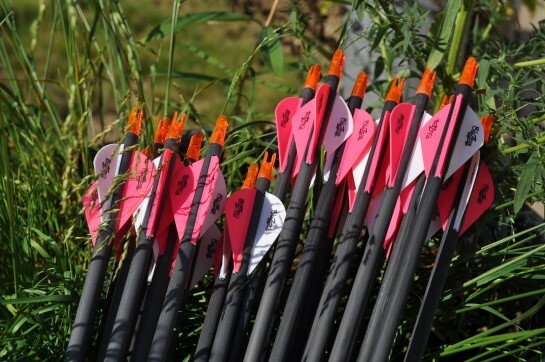 These archery tips will help you hone your archery skill levels by increasing accuracy, consistency and ultimately assist you in bringing home the bacon... so to speak. Seriously though, archery is a great sport, for all ages and walks of life. For our purposes we will focus on bow hunting and recreational archery, as the target archer tends to use specialized equipment and significantly different techniques when shooting their bows. Probably the number one fault of all archers is the lack of good practice. I say good practice because if you practice with bad habits or bad form, you will never correct them. Similar to a bad driver teaching someone to drive; they too will become bad drivers. What can you do about it? Well there are a couple of ways to get your archery performance up to snuff. One way is to video yourself. Try setting up your video camera at various angles and then record your shooting sessions. Be critical while you watch yourself; make mental notes for things to watch out for. The second way to enhance your archery performance is to have someone watch you. If you know an accomplished archer, have them watch you draw and release your arrows. Don't be afraid of a little criticism, after all that is why you asked… right? A super important form aspect that is often overlooked but we all know about is the anchor point. Are you dropping your elbow? Your drawing arm and elbow should be parallel to the ground when at full draw. Is yours? Is your bow draw weight too much for you? If you have to point your bow at the ceiling and use your arm and back like a fulcrum, your draw weight is probably too heavy for you. You should either set your draw weight back or choose a bow with a lighter draw weight. Do you jerk when you release your arrow? It does not really matter if you use a finger or thumb release… when your arrow goes downrange it should almost be a surprise to you. When you come to full draw, are you waiting until your sight pin is exactly still on your chosen target? If you are, then you are most likely holding too long. With all the tension in your body while holding your arm up at full draw, it is impossible to hold a bow sight perfectly still. Mastery of the wobble zone is all it takes. How do we get control of the wobble zone? "Use the same anchor point every time." If I had a dollar for every time I heard that, I'd be rich! If I would have only listened years ago! What is this Anchor Point and where is it? I cannot answer that definitively because every archer will have a slightly different point. This archery tip is so very important and that is the reason you hear it talked about all the time. Let me describe my anchor point. I use a finger release (True Ball) with a Velcro wrist strap. So far it has served me well. As I come to full draw my wrist rotates so the back of my hand is parallel to my face. When I reach the "back wall" I place the knuckle of my middle finger on the corner of my jaw bone. My knuckle and my jaw will only have a thin layer of skin between, this means there is no doubt about front to back movement. I find this point easy to locate even when I wear gloves. Let me be clear about this… finding your anchor point is key to consistency. If, for instance if you miss your anchor point by 1/4 inch your arrow will not make its mark. Sure the arrow will be close enough (bulls eye miss of approximately 2-3 inches) at 10 or 15 yards to kill a deer, but what about at longer distances? 10, 15 maybe 20 or more inches off target will equal a sure miss or an injured animal. Not so good! I always find that when my shots start to wander (for me, that usually means up and to the right), I am not locating my anchor. I tend to want to let my knuckle slip behind my jaw for some reason. Just one of those annoying little mistake I make on occasion. Once I get back to where my knuckle meets jawbone my shooting improves immediately. Why did I pick this as an anchor point? Good question! In my case I chose this for the case when I where gloves or mittens in cold weather I still find it relatively easy to locate. I know some archers hook their knuckle behind the jaw or even their neck but for me with heavier gloves those point seem to change my point so much I cannot shoot consistently. You have to find the anchor point that works for you, and "Use the same anchor point every time." When I practice I will often use very small (3/4 inch) target faces to aim at. Of course this is only for close distances, say around 10 yards. If you use these small dots as targets at distances too great you will find they are too hard to see. Practice letting your bow sight pin ~wobble~ or move around your aiming mark. Concentrate on it… remember you cannot be still on it! Let your pin crisscross over your mark. Let your arrow go when the sight pin crosses the aiming mark. Don't hold too long though, fatigue will set in. Once you get tired, quit for the day. No point in practicing bad form, which, by the way is what will happen if you continue to practice after your muscles are worn out. I practice a lot, and you should too. I try to practice at least 3 days a week, even if it is in my garage. Use smaller aiming points for close distances. In time you will find the wobble zone gets smaller, and your shot placement is more accurate. Have a look at the video where I practice at 10 meters. Why Practice at Short Range will Help? Today, modern bows are quite capable of having velocities of well over 300 feet per second, but I can assure you that a lot can happen from the time you release your arrow and the nock clears the arrow rest. One of the things you can do to improve your accuracy and steady your bow is to install a bow wrist sling. I know it is only .008 of a second (8 one thousands)... that doesn't sound like a lot I know. Make any little movement, your head or one of your hands during that .008 seconds and you will see just how much that will change the course of an arrow. Practicing at short range is an awesome archery tip... especially for those who cannot get out to where there are long ranges to practice at. The importance of this archery tip is to perfect your form. The more arrows you put down range the better the archer you will become. That my friend is an easy formula! Correct those little errors you make, practice at short distances with tiny aiming marks. Zero in on the center. Once you perfect your short game the long range stuff is easy. We have started a series of videos that will demonstrate archery tips. Be sure to come back often to check for updates. Keep in mind I am not a professional videographer, so the quality is not something you will find on TV. But it is real, and sincere. More archery tip discussions and recommendations.